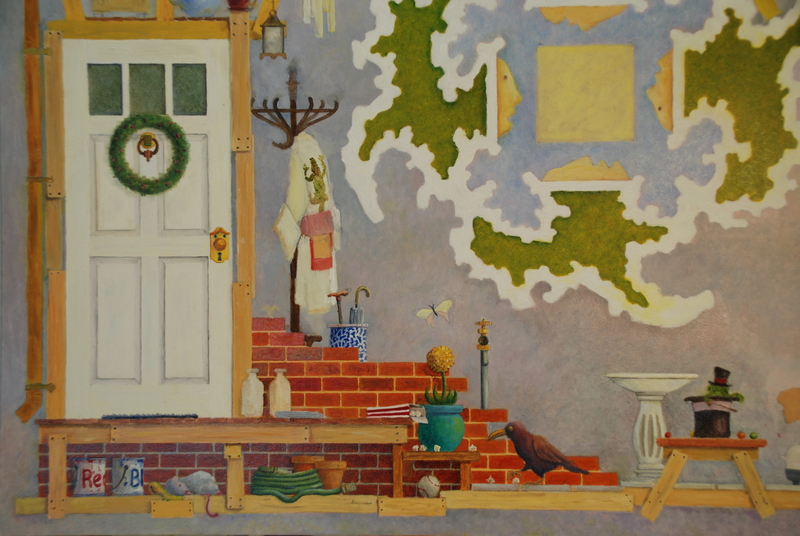 As I work with detail in the second corner area of the painting “The House That Jack Built” I am posting a past Art image as an “Intermission”. 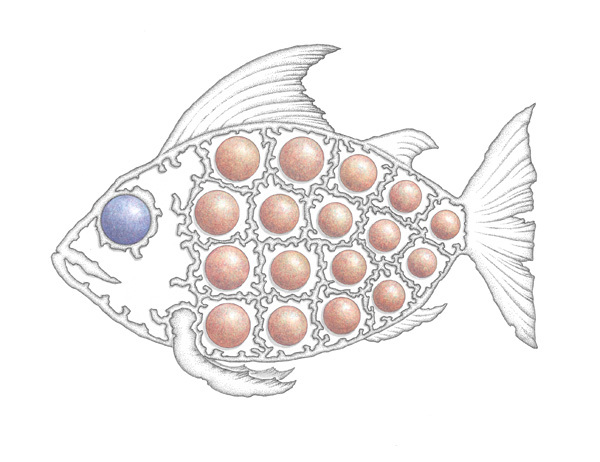 For this intermission, the above Pen & Ink/Watercolor drawing is entitled “Fish”. This drawing was completed in December, 2006. Today, Monday, October 27; “Intermission”. 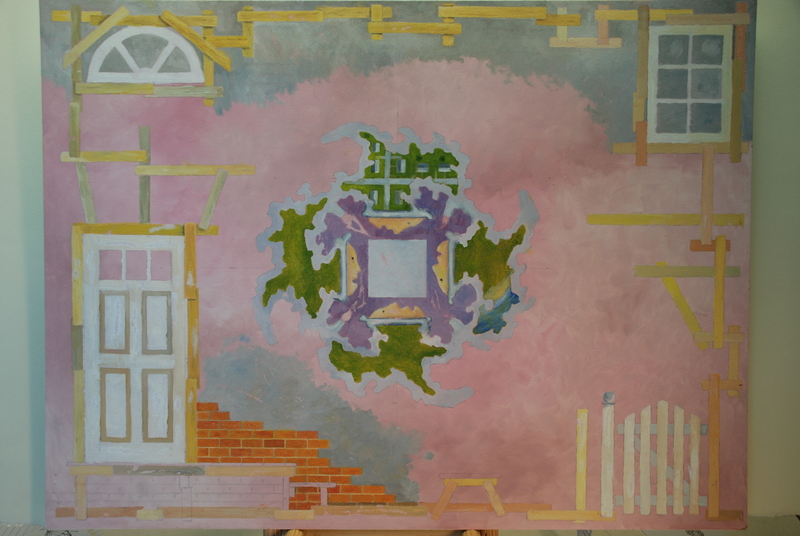 Monday, November 3 and following Monday’s; Post continuing progress images of “The House That Jack Built” painting. All the “buzz about town and 3/4’s of the country” (o.k., make that 5/8’s) has been about the items inserted into “The House That Jack Built” painting. It is only fair that I take an opportunity to introduce “Jack”. 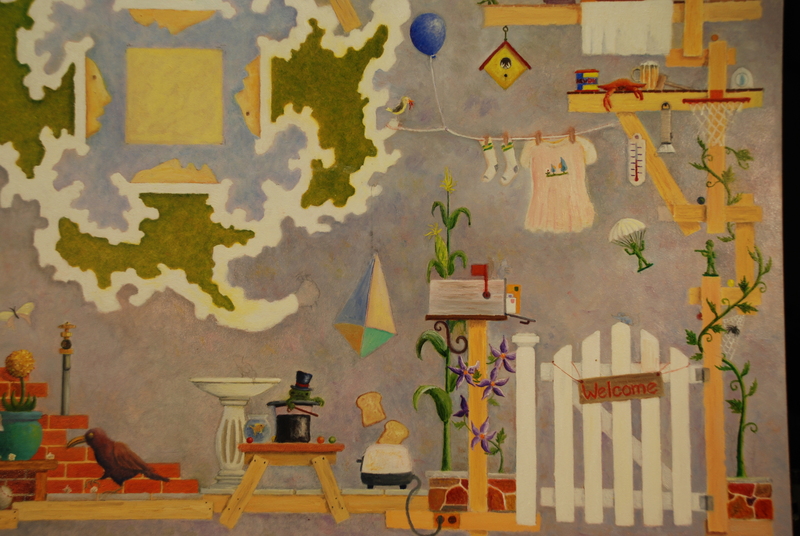 This forgotten center section of the painting is the area that was the original “doodle” way back in my days of youth. A friend I’ve known for many years, “Jack” is not just a designer/draftsman, but is also a carpenter, bricklayer, painter, and roofer. He can hang the gutter and downspout, install the plumbing and don the electricians hat when needed. Less not I forget, he has a canny sense for landscaping. Reflecting on this wide range of “Jack’s” abilities, it prompts my thinking that there should be some type of saying affixed for someone that is proficient in a wide range of trades. I’ll ponder. 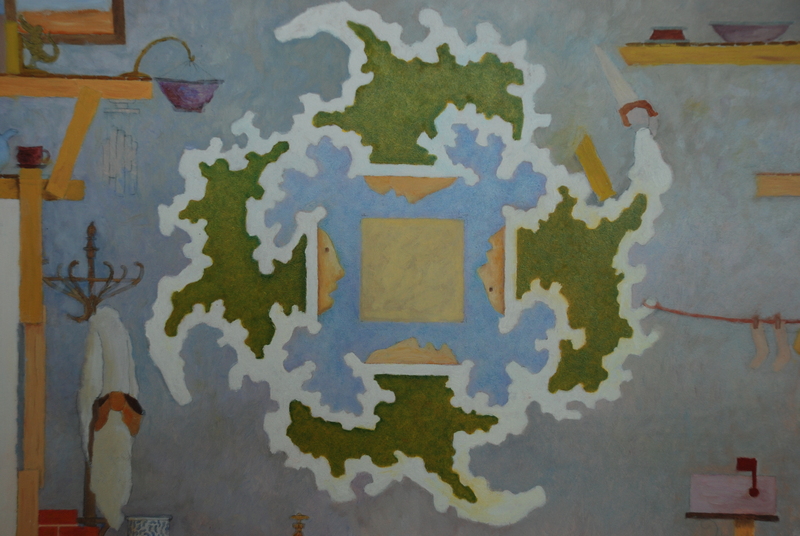 Back to the painting, this center motif, while a part of “The House That Jack Built”, is a separate painting of its own, and as this section of the painting also progress’s, I will interject a close up image of “Jack” from time to time. This image appears a little on the dark side, still working with lighting (flash creates too much glare). Today, Monday, October 6; “Jack”. Monday, October 13 and following Monday’s; Post continuing progress images of “The House That Jack Built” painting. 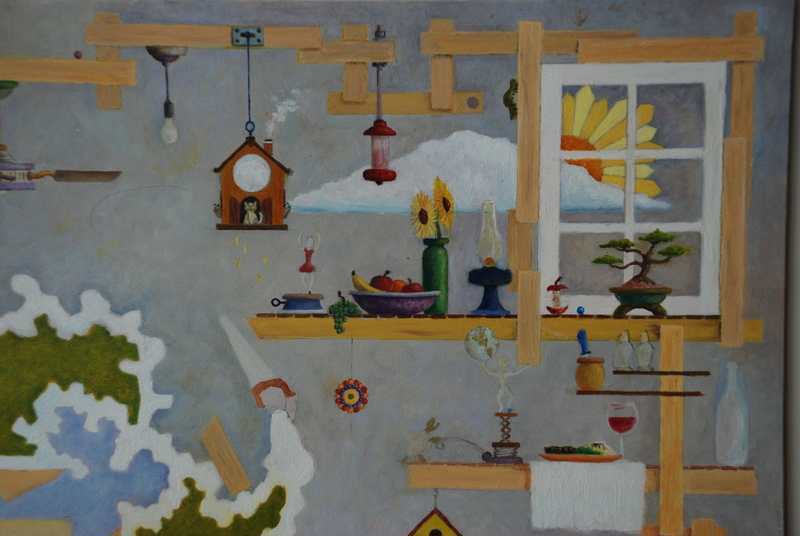 The start of the painting of “The House That Jack Built” is posted above. As I mentioned in the “Week 14” posting, I have made the purchase of a camera to allow me the flexibility to record the progress of the painting. A ‘used’ camera with no book of instructions, but the instructions are available on-line, of which I downloaded (162 pages). I have figured out some of the camera’s basic’s and the above photo of the beginning painted layout is my first attempts at hooking up the camera to the computer and downloading the image. Still working with lighting and at one point I will be trying to manipulate the image in the Computer program to better the posted image. The intent will be to post, each Monday, the progress of the painting till completed. There might be a judgment call of inserting an intermission image if I feel that the level of progress is not evident enough to show any major differences from the preceding week. Today, Monday, September 22; Beginning the layout of “The House That Jack Built”. 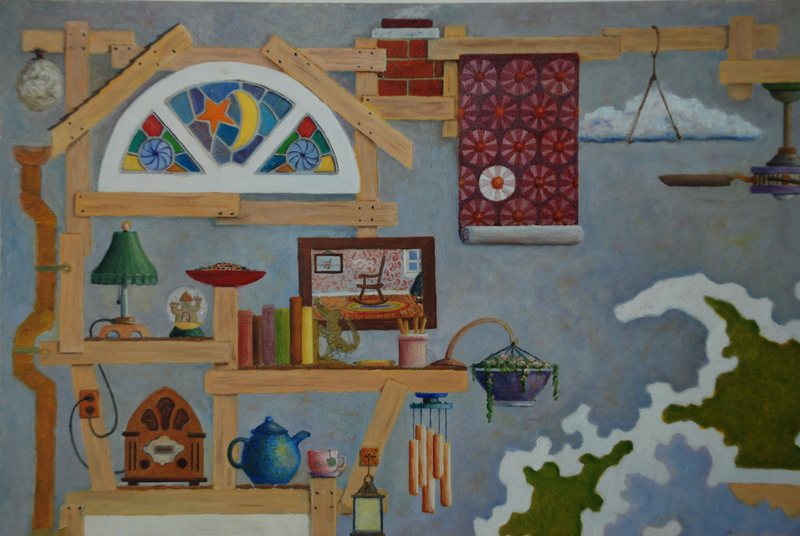 Monday, September 29 and following Monday’s; Post continuing progress images of “The House That Jack Built” painting.